Gurugram, Haryana, India/Businesswire India//– Can a bed cover uplift one’s mood? Can a cushion be a conversation starter? Can a lamp enliven a boring evening? Homegrown furnishing label, House This answers all of the above with the launch of their first retail store at DLF Galleria, Gurugram. 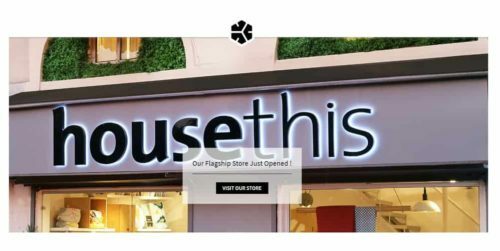 House This is a Delhi based design driven furnishing label offering contemporary décor & soft furnishing solutions. Established in 2011, House This is a Delhi based design driven furnishing label offering contemporary décor & soft furnishing solutions. Modern design language paired with Indian aesthetics and simplicity, House This aims to make every day décor simple. From bed & bath to kitchen & lighting, the brand’s unique designs are reflective of carefully thought-out concepts inspired by conservation of nature, forgotten cultures and art across communities in the world. Since its inception, the brand has succeeded in turning tides in the B2B & e-commerce trade and has finally forayed into retail, establishing its flagship presence. With a keen eye on trends and an astute knowledge of the Indian customer, the brand hopes to scale business by achieving a blend of e-comm and brick-mortar retail. “Roughly 80-90% of retail in the home décor market is driven through a brick & mortar model and we’re no different. While our website (www.housethisindia.com) generates great traffic, customers often come back asking for a physical store. It is a justifiable need to experience and engage with the product before making a purchase. We hope to support our online presence by developing our in-store capabilities and strengthening our take on experiential marketing. We look at getting to know our consumers beyond the shopping experience. This will help us further develop products that best meet their changing needs and preferences.” adds Pranav Pahwa, co-founder, House This. House This introduces the Indian consumer to an eclectic range of furnishings across major décor categories such as bed, bath, kitchen, curtains, rugs, wall art and lighting. The brand’s entire offering can be found in-store (Galleria, Gurugram) or online (www.housethisindia.com). The brand’s exclusive offerings are available across leading e-commerce platforms such as Amazon, Myntra, Jabong, Urban Ladder, PepperFry, LimeRoad, Tatacliq, Snapdeal & PayTM. The brand’s most celebrated kids range is exclusively available across Hopscotch & FirstCry.in. House This also retails at over more than 80 multi brand outlets across India. House This is a Delhi based design driven furnishing label offering contemporary décor & soft furnishing solutions. Established in 2011, the brand continues to introduce the Indian consumer to an eclectic range of furnishings across major décor categories such as bed, bath, kitchen, curtains, rugs, wall art and lighting. The brand’s entire offering can be found in-store (Galleria, Gurugram) or online (www.housethisindia.com). The brand’s exclusive offerings are available across leading e-commerce platforms such as Amazon, Myntra, Jabong, Urban Ladder, PepperFry, LimeRoad, Tatacliq, Snapdeal & PayTM. The brand’s most celebrated kids range is exclusively available across Hopscotch & FirstCry.in.